Richard Earp at Fraser Yachts tells me he’s closed on his listing for sale, the 53.3m motor yacht South with Moravia Yachting acting for the buyer. 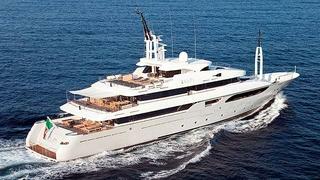 South was built by Italian superyacht yard Rossi Navi to a design by Officina Italiana Design and delivered in 2008. RINA charter classed, she has accommodation for 12 guests in six staterooms including a master and VIP suite on the main deck with two doubles and two twins below. All staterooms come complete with satellite television, DVD systems, audio and video on demand, and en suite bathroom facilities. Twin 2,200hp Caterpillar engines give her a speed of 16 knots with a range of 3,500 nautical miles. Notable features are large deck spaces and reception areas, an elevator to all floors, a gymnasium, spa pool and video/meeting room plus she’s fitted with zero speed stabilisers. South was for sale by her original owner.